What are the benefits of ENERGY STAR gas boilers? Radiant warmth: Delivers cost effective radiant warmth evenly and consistently throughout your home, warming your body rather than just the air in the room. Zonal heating & choice: Separate areas or individual rooms can have their own temperature setting, adjusted to your preference. Choose between radiators or radiant floor heating. Smaller space requirements: Compact size and ductless design allows for valuable space savings in your home. Ideal for open concept designs or homes of any shape or size. Versatility: Options for space and water heating in one system provides versatility and less mechanical equipment in your home. What are the costs of a high-efficiency boiler? Costs for purchasing and installing a high-efficiency boiler system can vary significantly based on the size of your home, the type, make and model of boiler selected, as well as design and installation considerations. Installing an in-floor heating system is typically more expensive than installing radiators. Be sure to get multiple quotes from contractors to compare costs, installation approach and warranties. How do I ensure that I get the right gas boiler for my home? Getting optimal performance from a new ENERGY STAR® certified boiler depends on more than just choosing the right equipment. Consult with experts: Ask an energy advisor or contractor how an ENERGY STAR certified boiler could transform your home. Get a heat load calculation: Ask the builder to confirm that the heating contractor calculates the heat requirements to ensure your gas boiler is sized properly. Ask about hydronic design: To ensure optimum performance and efficiency, make sure your contractor talks to you about all of the components, design and installation details for your system. Don’t forget about commissioning: Commissioning is a critical quality assurance step that should not be overlooked to verify and document that the engineered performance has been achieved. Maintain your equipment: Similar to servicing a vehicle, preventive maintenance is a good investment to minimize future problems. Arrange for annual servicing. Make regular adjustments to the controls of your system to ensure optimal functioning. Consult the owner’s manual for details. What maintenance does my gas boiler require? To ensure that your gas boiler operates safely and reliably, it’s important to maintain your boiler by having it cleaned regularly and scheduling inspections. Read through your boiler’s owner’s manual for maintenance recommendations specific to your make and model. Maintenance should be performed by a licensed gas contractor who is trained and licensed in gas boiler maintenance. For more information on maintaining your gas boiler, visit FortisBC. Can I use my boiler to also provide domestic hot water? There are combination space-water heating systems that use hydronic boilers instead of water heaters. 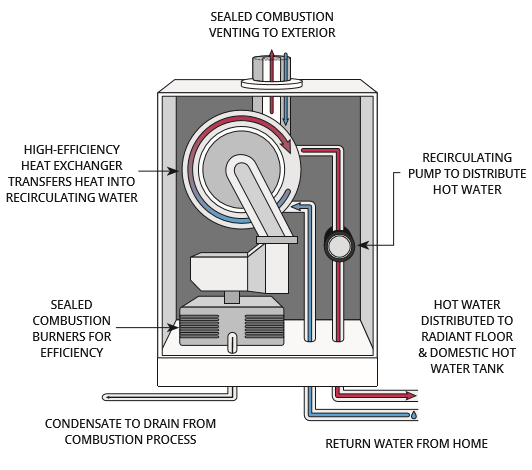 The hydronic boiler transfers heat through an exchanger to heat water for your home. Please note that combination systems must be professionally designed and properly sized. When hiring a contractor to install your combination system, they must be certified by the Heating, Refrigeration and Air Conditioning Institute of Canada (HRAI) for designing combination heating systems. For more information about combination systems, visit Natural Resources Canada and the Water Heater Guide. What accreditations do I look for when hiring a natural gas installer? When hiring a natural gas installer, look for a contractor that’s licensed with the BC Safety Authority, professionally trained, and in good standing with the Better Business Bureau. For more information, visit the Hiring a Contractor FAQs.